Guest Post: Scholastic Scribe « You know… that Blog? Gotta say, I’m really enjoying my GPM (Guest Post Mondays) series. At first (I admit it) it started out as a rather lazy way to keep my blog fresh and moving along without actually having to use up too many of my remaining brain cells, but I’m really enjoying the eclectic mix of people who have generously gifted me their time and efforts. Well, not crazy about last week’s, for obvious reasons, but her somewhat evil tendencies won out heart was in the right place! This week I’m so honoured to have my DC blog-buddy Melissa – AKA the Scholastic Scribe – gracing my humble blog. We don’t know each other well, but I so enjoy reading about her life and the escapades of her beautiful, accomplished daughters (Ella’s Numero Una and Dos). Like my blog, she writes about anything that moves her. Unlike my blog, she’s incredibly interesting, even without saying a word; her “superior snaps” always inspire happiness. I’m a child of summer. Usually by now in the DC area, temps are hovering around 80+ and the sun-soaked humidity machine is going full-blast. So, forgive me if I’m a little grumpy today. We had absolutely gorgeous weather all last week. Seventies, sunny, dry. I swear, I thought I’d died and gone to San Diego. But then one of those “marine layers,” which blow off the chilly Atlantic this time every year, arrived in town and parked itself, it seems, right over my house on Friday. Just in time for the weekend. And there it will sit, I’m told, for the foreseeable future. Mist. Occasional rain. Low-hanging cloud deck. 58 degrees, Fahrenheit, yo. Sorry, Mother Nature. I want to sweat. Despite my freckles and fair skin, I want to pretend I’m tanning. I want to get out and grub around in the dirt. The weeds have been calling my name for several weeks. I did get a positive sign on Saturday, though. 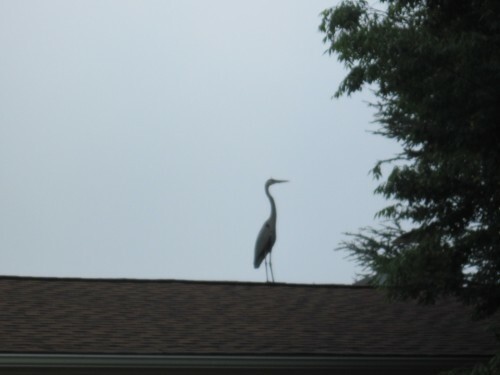 I know this sounds surreal, but the Blue Heron has come home to roost. Seriously. He winters in FLA and spends the more temperate ~ relatively speaking ~ DC summers on my neighbor’s roof. Yes, I live in a suburban subdivision. And no, beautiful sand beaches are not part of my landscape. Neither are palm trees and ocean breezes. But my neighbor has a well-stocked Koi pond. And to this yearly tropical visitor, I guess summer is just like shooting fish in a barrel. Maybe the big bird’s visit is a sign. Summer’s right around the corner, I’m certain. I hope the temps improve Melissa, I’m heading out your way on Thursday!! I really want to escape the bleakness that is Southern Ontario right now!! I’m sure Jenn will concur! You know I do, girlfriend! I like this Monday guest-blogger thing that you have going on. It is a nice way to see the writing of others. Melissa, I enjoyed your words … especially about the Great Blue for we are enduring very/too cool weather as I write. Maybe his appearance shall be an omen that stretches across the miles to us here in St. Louis. I sure hope so.